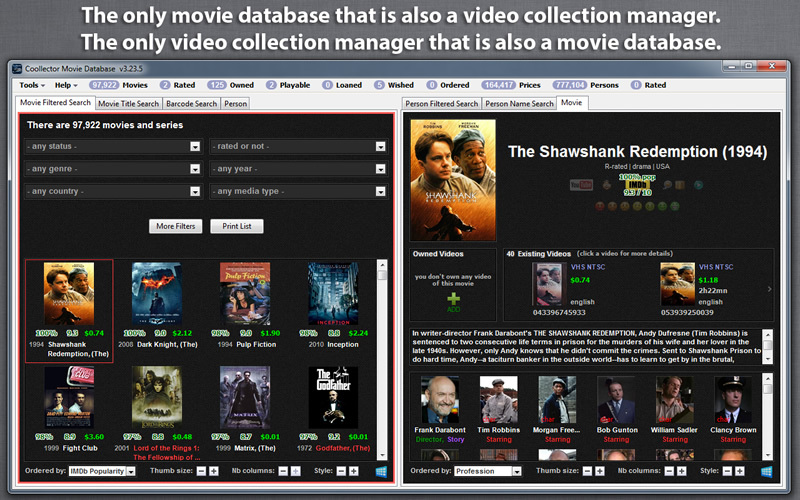 Description: Coollector Movie Database will catalog your collection of DVDs and video files. It will also give accurate recommendations based on your taste, helping you to decide what to watch and to discover great movies and series that you would have missed otherwise. Cataloging features: BLU-RAY, DVD, VHS: * manage your collection with all the technical details. * packs of movies are broken down into individual movies. * track what is stored where, and what you ve loaned to whom. * price information from Amazon US, CA, UK, DE, FR, ES, IT. * search by barcode. VIDEO FILES on your hard disk: * disk scanning recognizes the files automatically and super fast. * the play button launches the file with your favorite media player. NETFLIX and HULU streaming services: * explore their catalogs to evaluate if they re worth subscribing. * when subscribed, click a video to play within your favorite browser. Discovery and recommendation features: * includes an encyclopedia of 150,000 movies and series. * can be used offline. * complete movie casts, complete person filmographies. * movie posters, video covers, person pictures, character screenshots. * title search, filtered search with more than 20 filters. * very accurate rating system to rate every show that you ve seen. * rate series episodes or seasons to remember where you ve stopped. * outstanding predictions and recommendations (best-of-class system). * IMDb rating and popularity, direct link to the IMDb page. * link to Youtube trailers. * add movies to your wish list. Other features: * create lists by tagging the movies persons with any words you want. * write personal notes and movie reviews. * publish your lists online to view on your smartphone. * import data from other programs.